Gran Gaggia Black Style. Compact design and professional performance. With New Perfect Perfect Filter Holder. 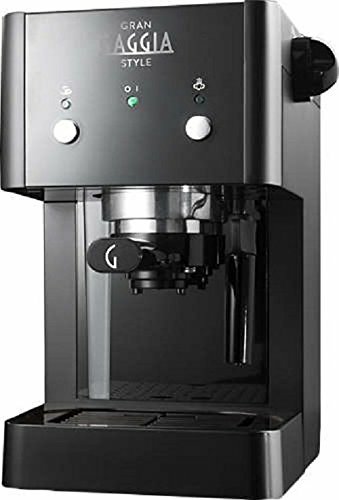 Pressure at 15 bar for a full espresso taste: the 15 bar pressure of your Gaggia coffee machine ensures a truly authentic taste to your espresso. Cupboard Plate: The cup plate on the top of the coffee machine always guarantees a cup at your fingertips. 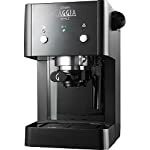 Compatible Waffles: The Gaggia manual machines come with a coffee filter for 1 or 2 cups of ground coffee and a special filter for ESE (Easy Serve Espresso) waffles. These ESE waffles are perfectly proportioned and make it easier to use the manual coffee machine. Pressurized filter holder for a perfect cream: the pressurized filter holder of the Gaggia machine will deliver an espresso with the perfect cream. 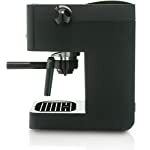 Rotating the classic puddle for a simple cream: The classic Parmarello of this Gaggia coffee machine, traditionally called “Pannarello”, turns milk into a wonderful cream of milk in a few seconds for a cappuccino, stained milk and much more. It also produces hot water for tea and can be rotated easily for an instant cream.